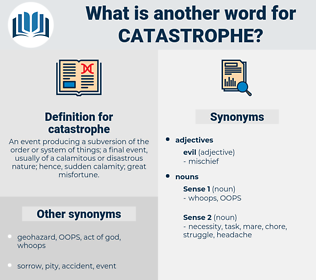 What is another word for catastrophe? An event producing a subversion of the order or system of things; a final event, usually of a calamitous or disastrous nature; hence, sudden calamity; great misfortune. cataclysm, destruction, mishap, crisis, peril, havoc, misfortune, wreck, incident, collapse, drama, Dramas, disgrace, mess, event. accident, scourge, devastation, conflagration, meltdown, crash, setback, holocaust, nakba, earthquake, damage. boon, cause, opening, commencement, start, gain, prosperity, comfort, miracle, aid, beginning, advantage, joy, benefit, wonder, luck, win, origin, success, help, good luck, assistance, favor, peace, blessing, delight, happiness, creation, birth, fortune, profit, good fortune. corker, dandy, manna, windfall, privilege, pleasure, phenomenon, jim-dandy, godsend, crackerjack. Not a detail of the catastrophe was lost to us. It was clear that the catastrophe of the government would be financial.